Last year, Mr Yasuke Sugawa was given an opportunity to talk about his life experiences and how his passion for learning and inspiring others to do the same has led him to where he is today. The article, published yesterday, also shares the various challenges that he faced and how he overcame them in time. With his motto, “Learning never stops”, he moves forward and encourages himself to seize the opportunities to be a better person. 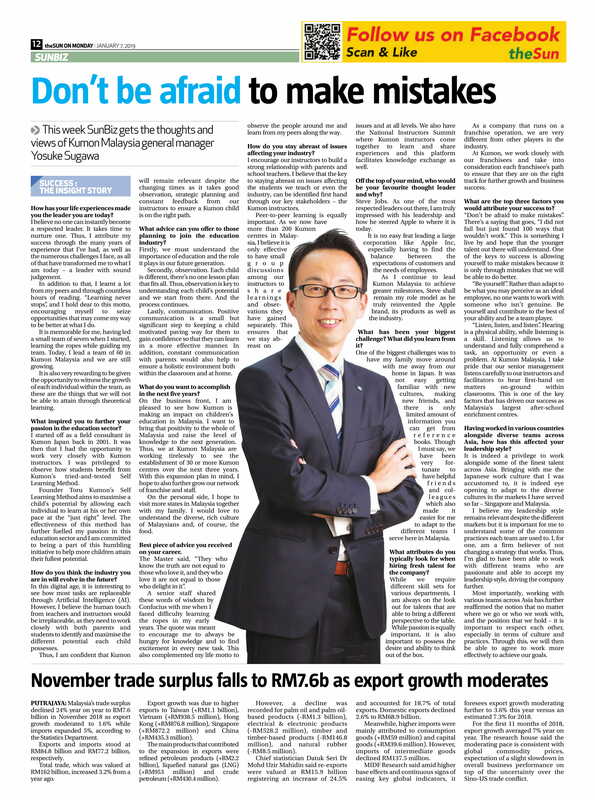 Mr Sugawa has been General Manager of Kumon Malaysia for almost 3 years and it is remarkable how much the company has changed since he has held the title. To be involved in education, especially in education center franchise, is never an easy route. He gave 3 tips to those who dream of being involved in the education line. First: Understand the importance of education. Second: Make observations since each child is different. Third: Always practise positive communication. Taking Steve Jobs as his role model, he believes he can lead Kumon Malaysia to achieve greater milestones and strengthen the Kumon brand. He also never feels afraid to make mistakes because only with mistakes, can people become better. To conclude, he reminds us that no matter where we go, who we work with or what position we hold, it is important to respect each other, especially in terms of culture and practices.